It was a fortunate audience, on Saturday 19th January, who were treated to a concert by this father and son duo who need no introduction to the Society. David Murray is Bishopwearmouth Choral Society’s Musical Director and one of the North East’s best known pianists, having accompanied many well known names and playing on notable occasions. However this was a much more significant event as his son, Christopher, returned to the North East to play alongside him. Christopher is a member of the dynamic and charismatic Heath Quartet – winners of many prestigious awards – and is now earning himself a well deserved reputation on the national and international stage. 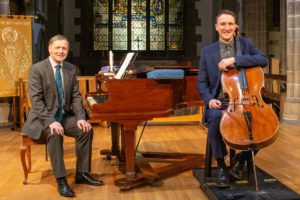 The combination of David and Christopher, cello and piano, and a varied programme provided a very memorable evening and a delightful contribution to the events of the Society’s 70th Anniversary season. This entry was posted on Sunday, January 20th, 2019 at 5:07 pm	and is filed under News.